To cook the potatoes, pour the oil into a roasting pan and place in a 425 degree oven. 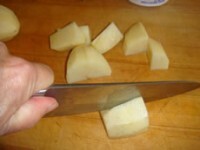 While the oil is heating, peel the potatoes and cut them into 2-inch chunks. 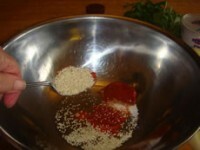 To coat the potatoes, mix the harissa, cayenne, salt, and sesame seeds in a large bowl. 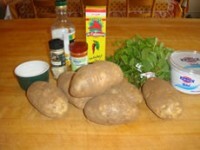 Toss in the potatoes and coat evenly in the mixture. 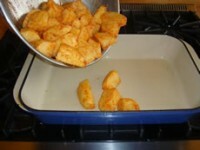 Remove the roasting pan from the oven and place the coated potatoes over the bottom in one layer. Return to the oven, and roast until the bottoms are nicely browned, about 25 to 30 minutes. With a metal spatula, turn the potatoes carefully, and bake for another 15 minutes until the potatoes are tender when pierced with a knife. 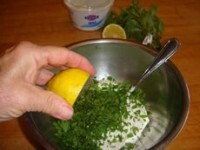 To make the sauce, mix the yogurt, mint, and lemon with salt and pepper to taste. 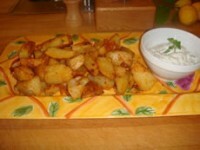 Serve the potatoes warm on a platter with the dipping sauce. Recipe adapted from NEW FLAVORS FOR VEGETABLES (Williams-Sonoma).